Okay, I cannot start this post off without telling you a quick side note about these photos. This was the last look Lauren and I were shooting the other week, and as we were getting ready to start snapping away, I felt something fall on my head/face. Instinctively I screamed and assumed a bird had pooped on me! Nope, it ended up being a ton of water that was dripping from the rain ducts at this building, and I just happened to be right under it. I don't think I've ever seen her look so concerned - she definitely thought it was way more serious than water! Haha! Anyways, on to my outfit. 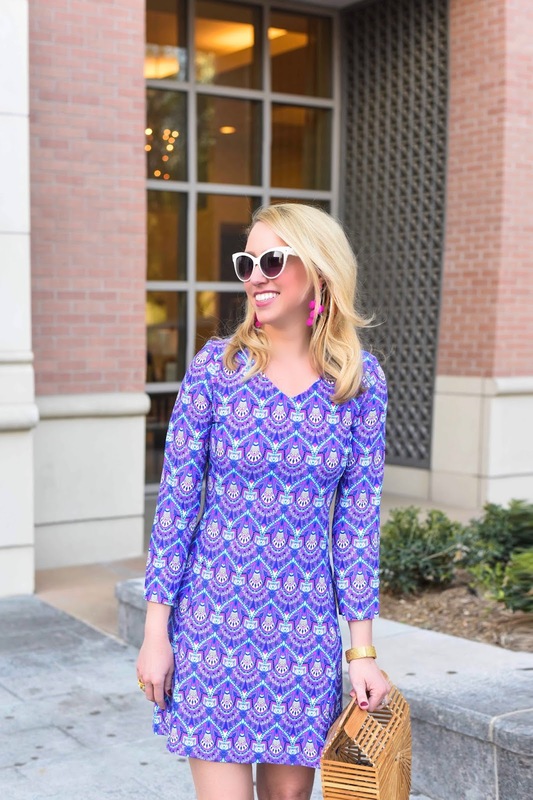 This dress is the perfect thing to be wearing rolling into the weekend! It seriously has me itching for vacation and summertime. I wanted to play up the summery colors by pairing it with these bold fuchsia earrings (only $20), and white wedges. You have no idea how many times I've considered donating these shoes. I don't wear them often, but then every once in a while an outfit comes along that goes perfectly with them, so I'm grateful I didn't give them up. Speaking of white, with Memorial Day right around the corner, I'm so excited start wearing all my white again. In all honesty though, I feel like that "rule" doesn't really exist anymore. Everyone in Houston wears white year round (I think because it's always warm), and I never give up my white denim...even in the middle of winter! I hope you guys have a wonderful weekend and have a fun St. Patrick's Day! Don't forget to wear green!